A rare colourway of Doulton’s Little Bridesmaid HN1530. 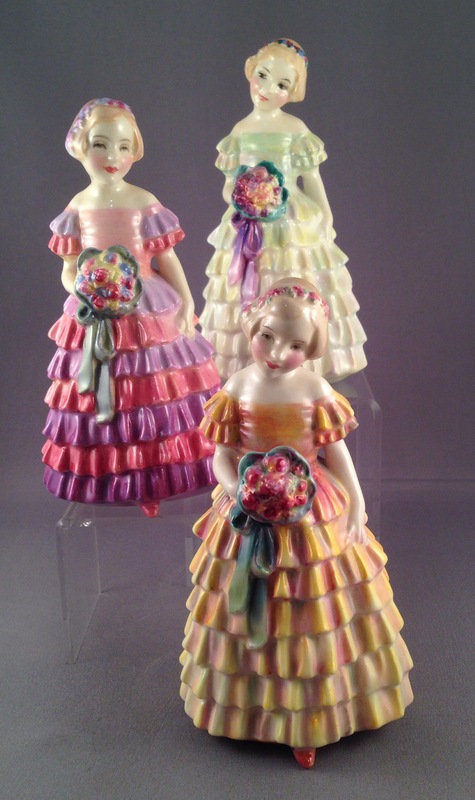 I thought I would share this picture of the three versions of The Little Bridesmaid as the final colourway HN1530 was not available for the last edition of Royal Doulton Figures in 1994. As is typically the case if you wait – sometimes for countless years – that one piece may turn up. 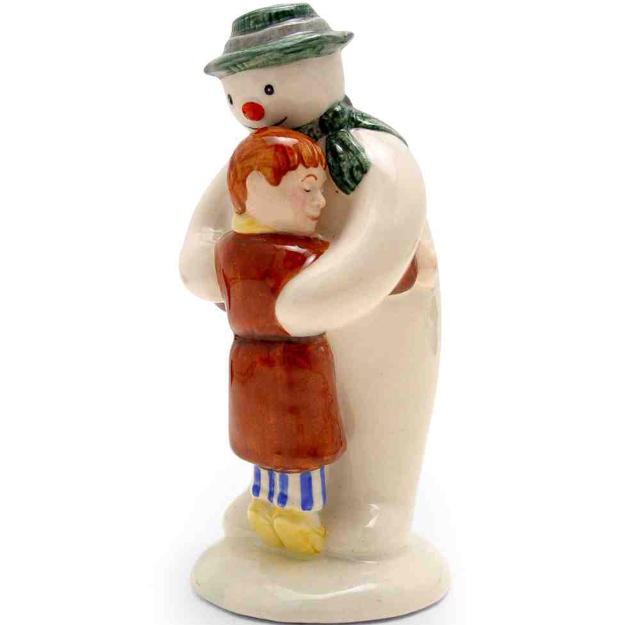 This popular figure remained in production as HN1433 until 1951 and keen eyes can easily distinguish earlier and later versions based on the depth of colour, the backstamp and face. The elusive HN1530 belongs to a small group of figures with early HN1500 numbers including Pantalettes and Priscilla who were issued once again in complimentary orange colourways just like this Little Bridesmaid. The yellow HN1434 is the earliest example in the picture above and you can hopefully see how the angle of her head differs to the other two. Alas her head is often prone to being knocked off! Making these three perfect examples all the more unusual! No other area of Doulton offers more scope than the collecting of miniatures and Doulton’s Lambeth factory created the lion’s share of these miniatures. Not including cruets, bird feeders, advertising items, inkwells, teawares and many other lines that were produced in a small scale, as you can see above there are numerous vases, flasks, containers, whimsies and other items that can be found in miniature. Doulton’s famous Huntingwares, produced over many decades, are perhaps the most easily found but again many subtle variations exist. 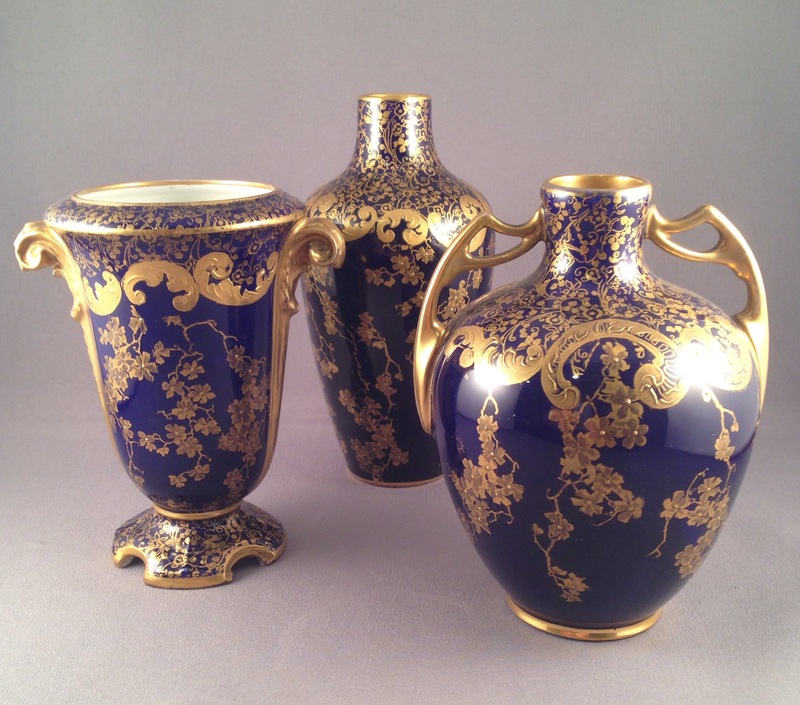 Brown, green, blue and metallic glazes can be found decorating them as in the picture below. These items can be found with silver or plated silver mounts in a variety of shapes. Other such applied patterns can also be found if you have a keen eye including a Willow design and the rare Naval reliefs. Many of these miniatures were perfume bottles. Here on the left is one such example for the old London department store Jason Shoolbred & Co and these were stamped as such to their bases. Naturally many typical art wares can be found in miniature like the vases and ewer above and there are some examples above including the Mark Marshall rabbit paperweight, again pictured above. 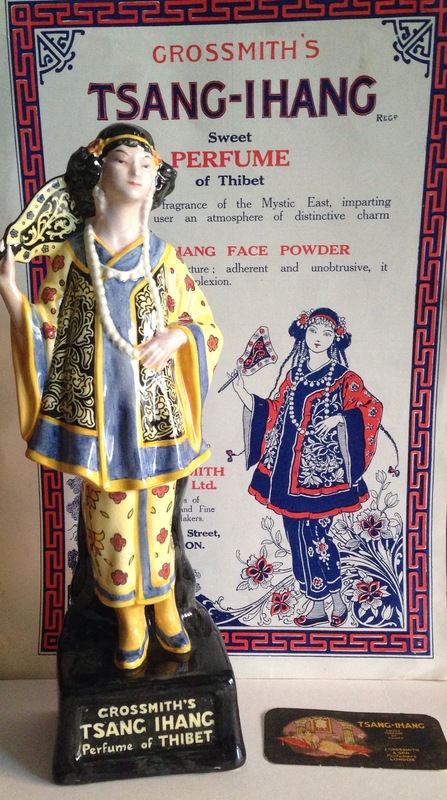 Other lines containing miniatures are the simulated wares such as blackjacks and also the many commemorative wares produced to mark events over the years. A particular favourite are the Nelson miniatures! 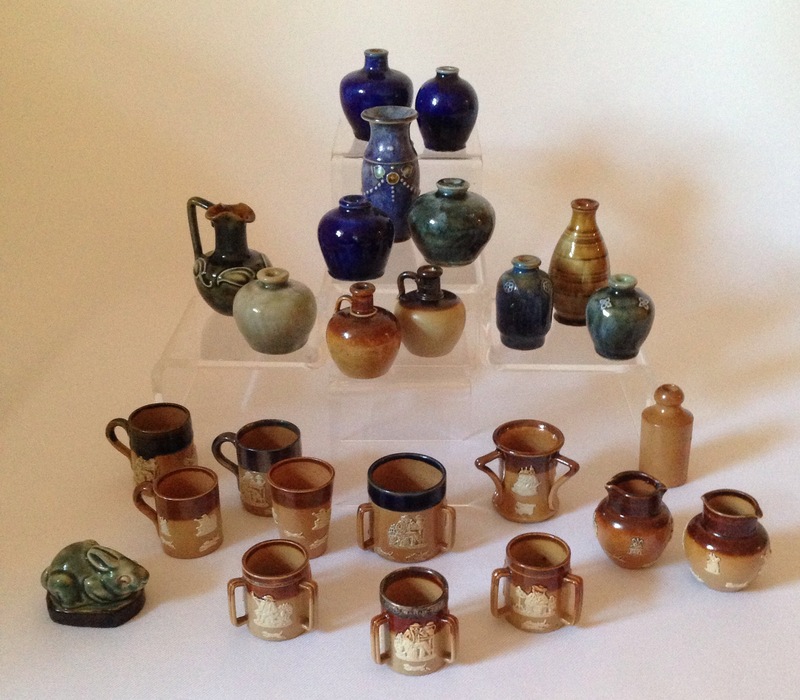 Perhaps you too collect miniatures, if so why not share a photograph on our Doulton Collectors Group Facebook page! 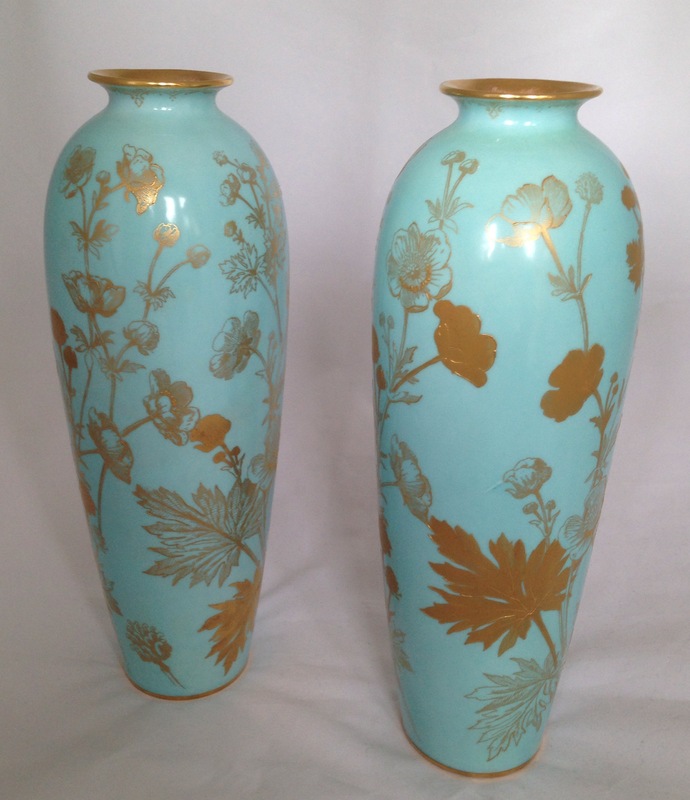 Collecting Doulton’s floral gilt silhouette vases! 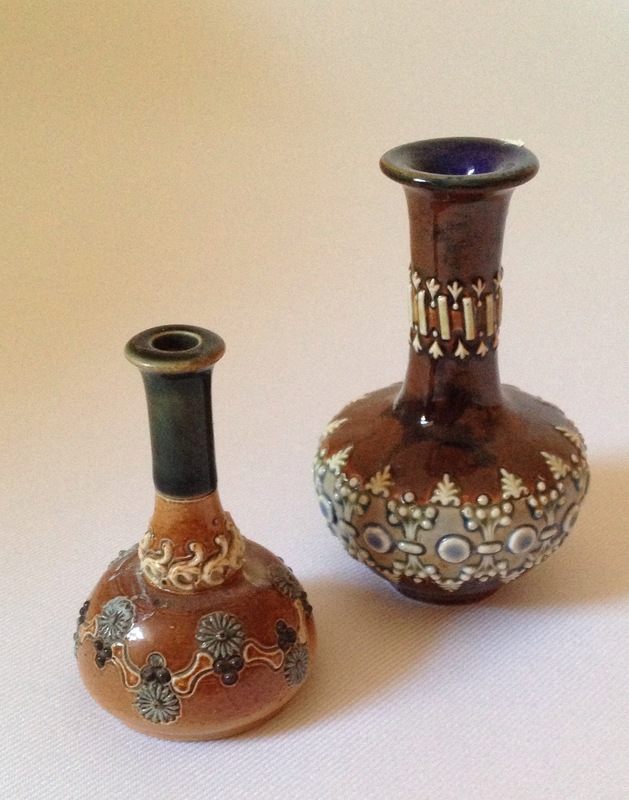 Thanks to Harvey’s Collectibles for the above picture of a pair of vases in their collection. Dating to 1900-02 they are not easy to find and I have seen the same pattern on a pink body only once before. Interestingly they are from the Robert Allen studio at Burslem as is confirmed by the RA number to each of their bases. The numbers relate to design books and we are able to date items using these RA numbers. Above and below are further examples of gilt silhouette flowers and foliage from the Robert Allen studio and date slightly earlier to the late 19th Century. 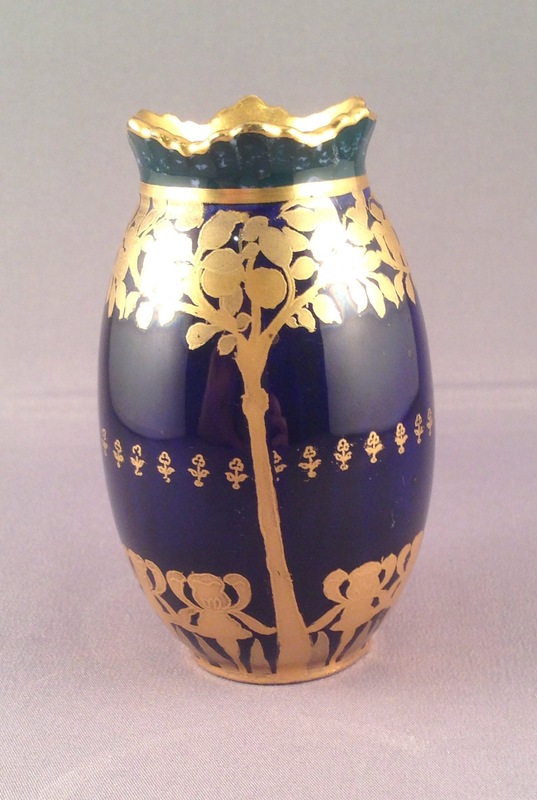 The miniature vase below is more typically found in white and light blue rather than cobalt and gilt. 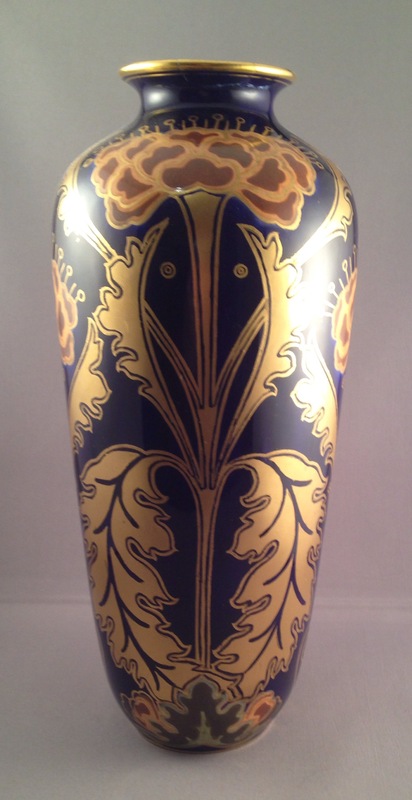 This final vase illustrated Doulton’s ability to change and adapt designs as this is usually found decorating toilet sets rather than gilded cobalt blue vases! Harradine’s inspiration for his figure Anthea. 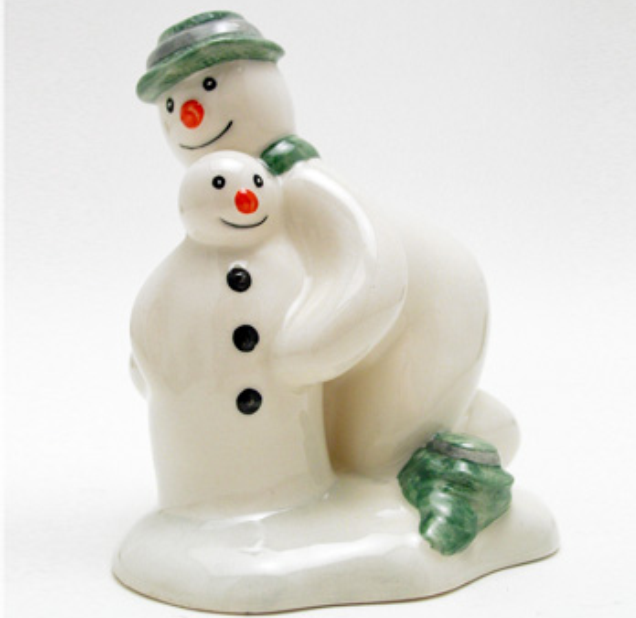 As you know I always love to discover the inspirations for our favourite Doulton figures. Here is another that didn’t make the final cut for Jocelyn’s and my book ‘Reflections’. 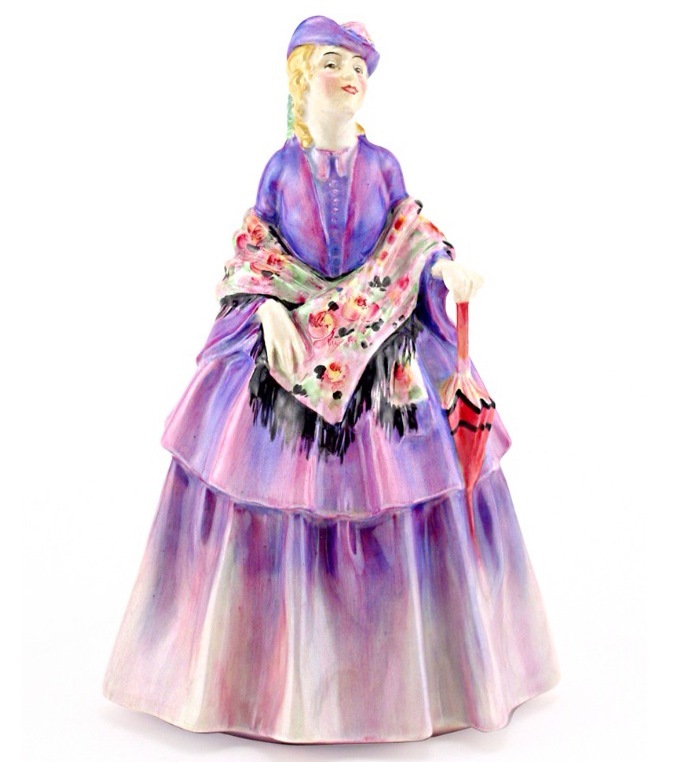 It is itself a figurine but this time a wax figure by Agatha Walker that she produced as part of her series of figures from the stage in the 1920’s, imitating a popular tradition from the 19th Century. These figures were made of plaster, then coated in wax and finally painted. 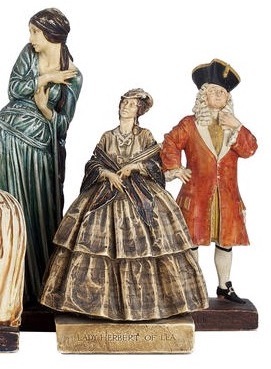 Typically Harradine has put his own flourishes to the finished figure including a parasol and changing the direction of Anthea’s head. 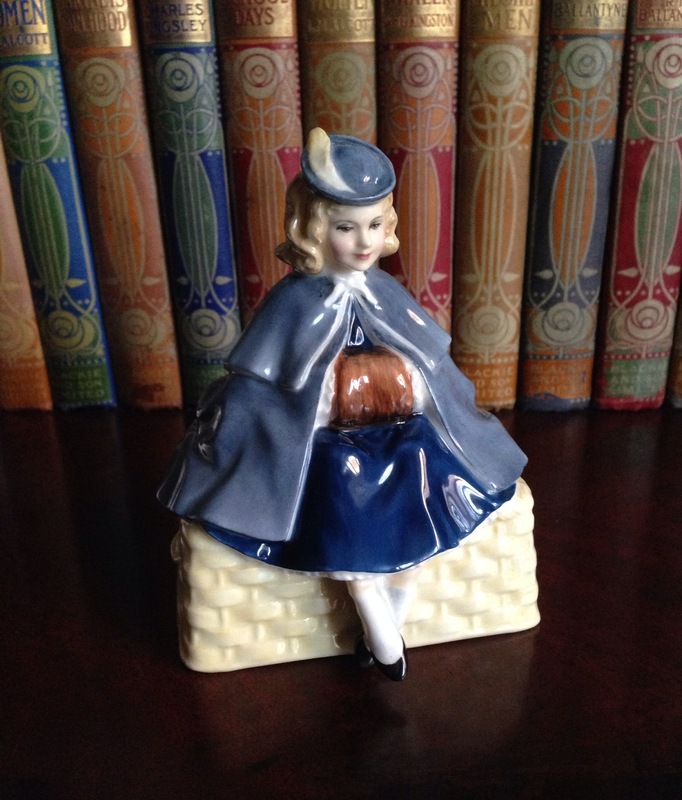 To date I have found only one other Agatha Walker figure that Harradine used, but that’s for another time!